1 Master w/Queen, 2 w/Queen, 2 w/2 Twins, Queen Sofa Bed. Sheets and Towels Provided, Beds Made. 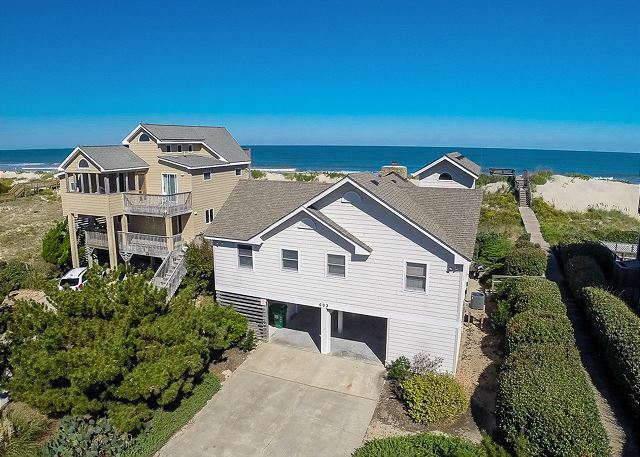 Oceanfront, charming just steps from the beach access. 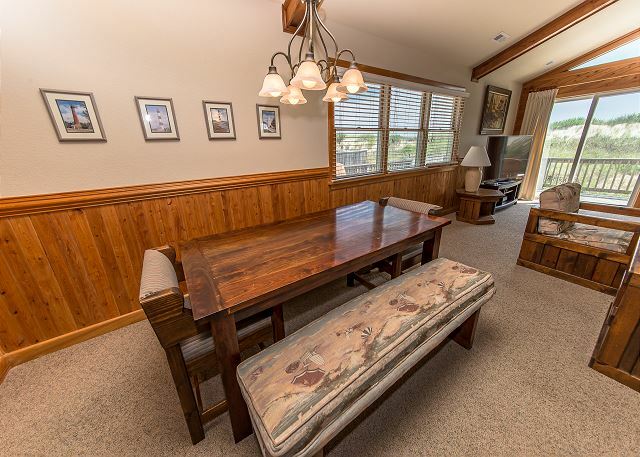 You will love this home as your own "special place" to return to year after year. Great sunrise and ocean views from the loft. 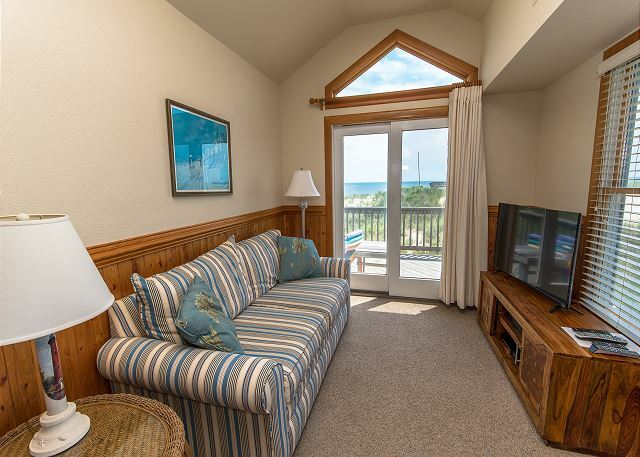 Amenities include Beach chairs, DVD's, games and books, Port-A-Crib, 3-zone central heat and air, great room w/beamed cathedral ceiling, deck off the loft, breakfast bar, laundry tub, gas fireplace available from October to April, free DVD/movies/videos from Goodvibes, sand toys. 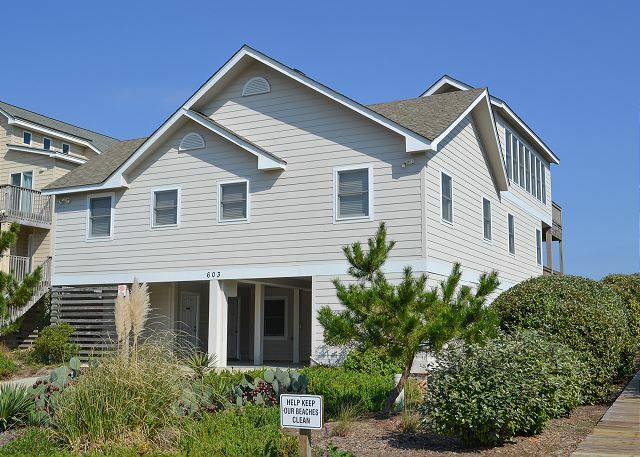 Conveniently located near dining, shopping, grocery stores, Currituck Club golf and tennis courts. 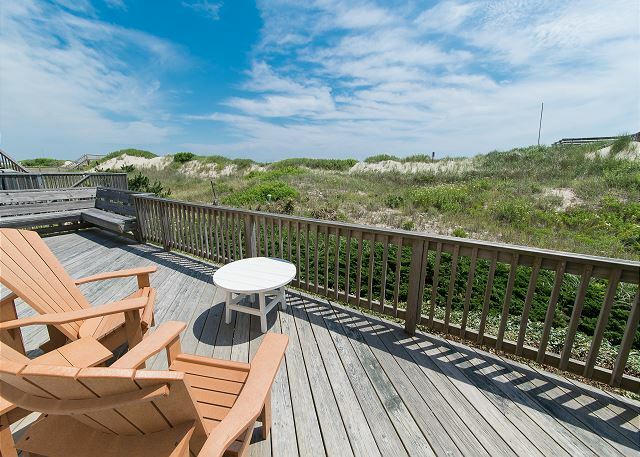 Make your summer memories everlasting in this oceanfront getaway. A short 20 yards to beach access. Boardwalk by house. No Pets Please. Repeat Renter Discount: 5/29-6/4 $50, 6/5-8/20 $100, 8/21-9/3 $75. 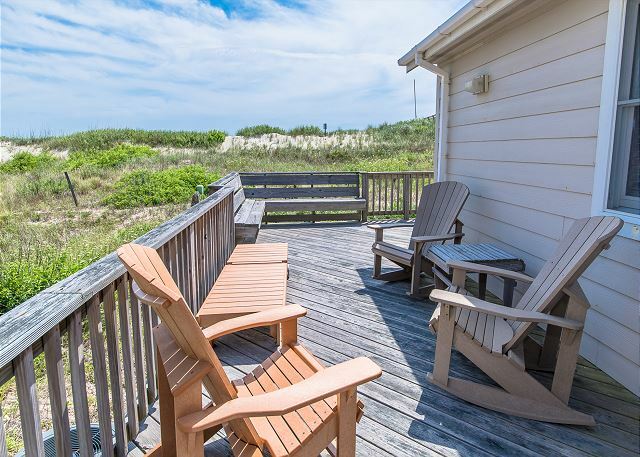 Outside: Parking for 6 (2 under the House), Outside Shower, Boarded Walkway to the Beach w/Large Dune Deck w/Built-In Benches. 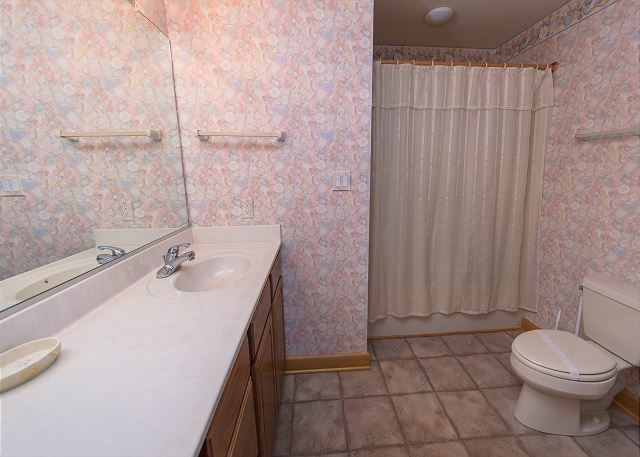 Ground Level: Queen Master Bedroom w/Full Bath w/Double Sinks. 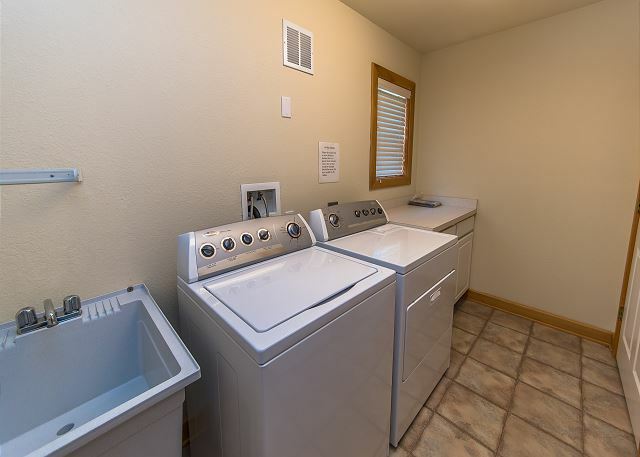 Laundry Room w/Wash Tub Sink, Washer and Dryer, Full Hall Bath, Den w/Sofa, Chair, TV/VCR/DVD, Table w/4 Chairs, Door to Back Yard area. 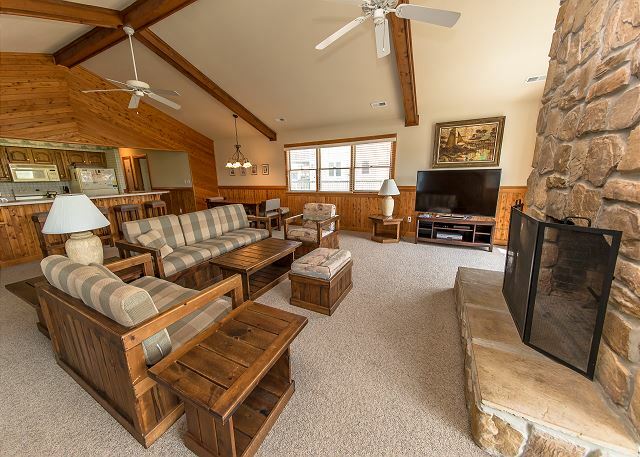 Mid Level: Great Room w/Queen Sleep Sofa, Love-seat, Chair, TV/VCR/DVD, Wood Fireplace, Desk w/Chair and 3 Sliders to Decks w/Furniture. Dining Table Seats 8, Kitchen Bar Seats 4. 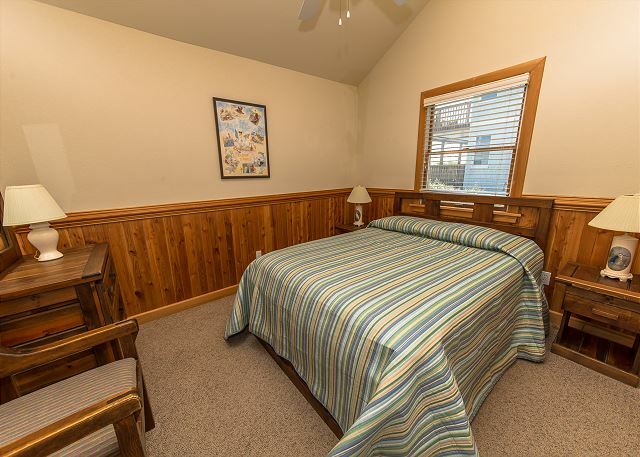 Queen Bedroom w/Slider to Deck. 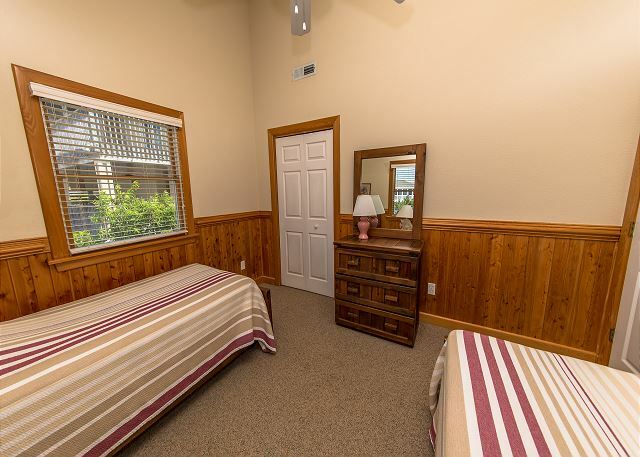 Bedroom w/2 Twin Beds. 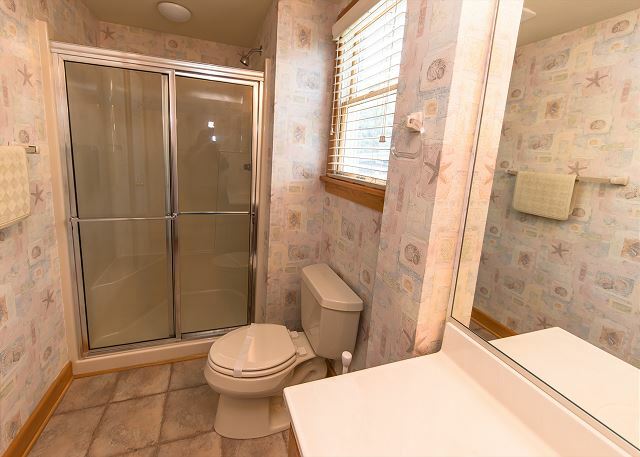 Full Hall Bath w/Stand-Up Shower. Queen Bedroom. 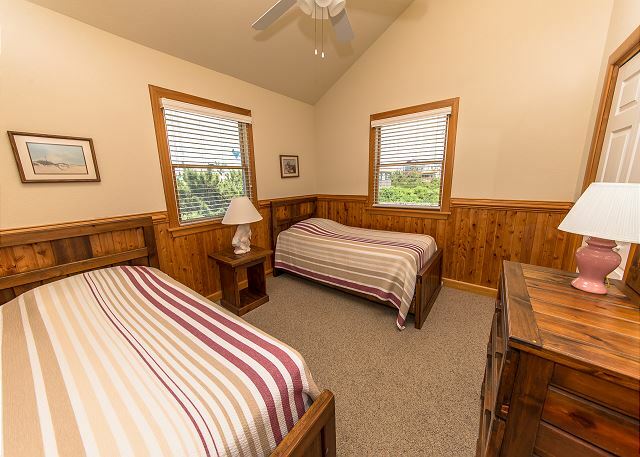 Bedroom w/Twin Beds. 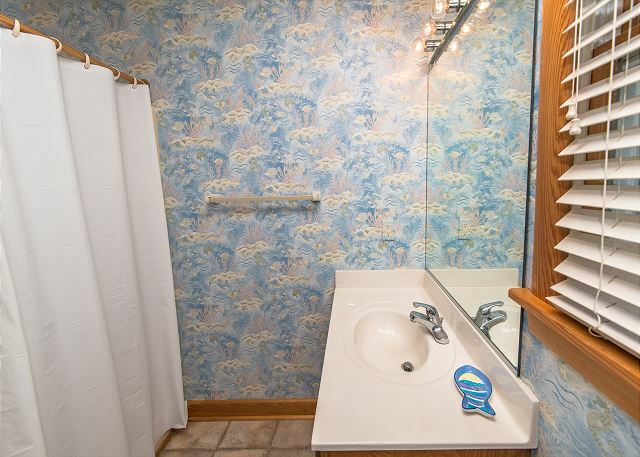 Full Hall Bath. 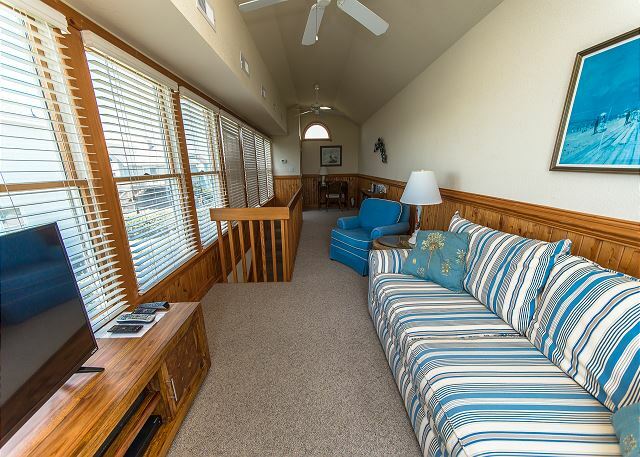 Upper Level: Loft Room/Den w/Sofa, Chair, TV/VCR/DVD, Desk w/Chair, Slider to Small Balcony w/Ocean Views. Location: 2 small block to the beach ramp (175 yards). It's so short that you can run back and forth to the house as needed without missing the fun. 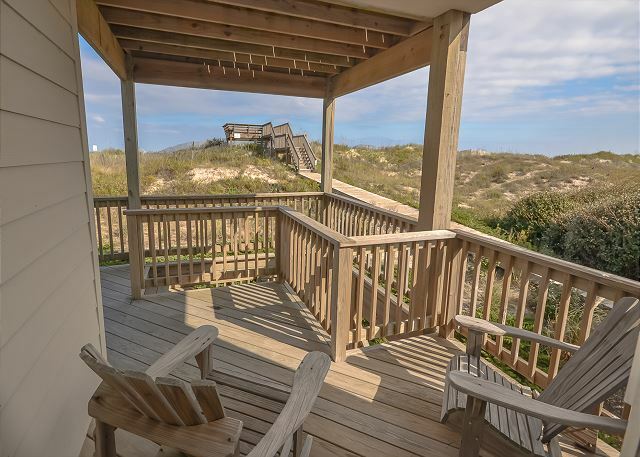 On the top front porch you can see the ocean, “wow”. Also, the shopping center with Harris Teeter is across the street if you want to take a 5 min walk to have dinner or gets some sweets. 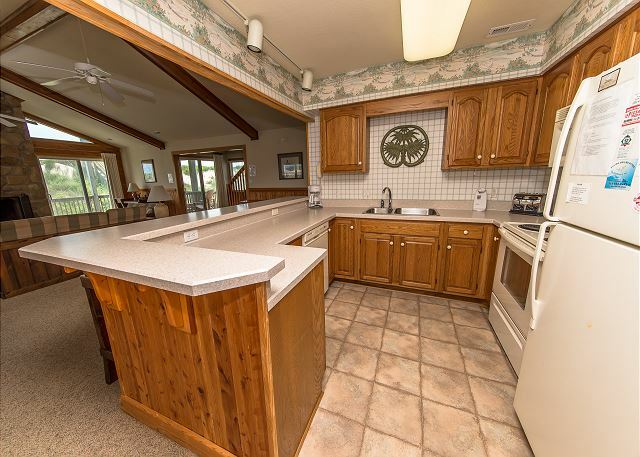 Kitchen: Yes, all the cooking space and counter top you will ever need. We had a party of 12 and 3 people was cooking at one time without running into each other. Internet: Per my teenager and young adults. The internet had a strong signal that reached all the way down to the pool. They were happy. Owners: Personally reach out to me to see how my stay at their home. Nice customer service touch." Great stay at the beach! We had a wonderful stay here the third week of August this summer! 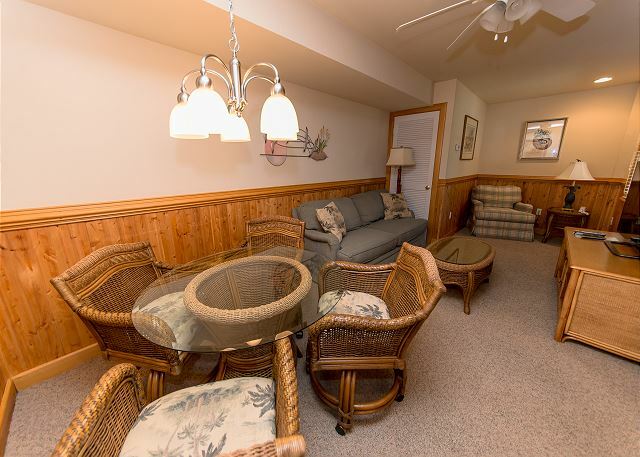 The house is in a great location and had plenty of space for our needs! The owners called mid-week to check that everything was going well with the house, and even had a most delicious peach cheesecake delivered to us! The kitchen is on the small side, and the living room sofas seem a little small as well. 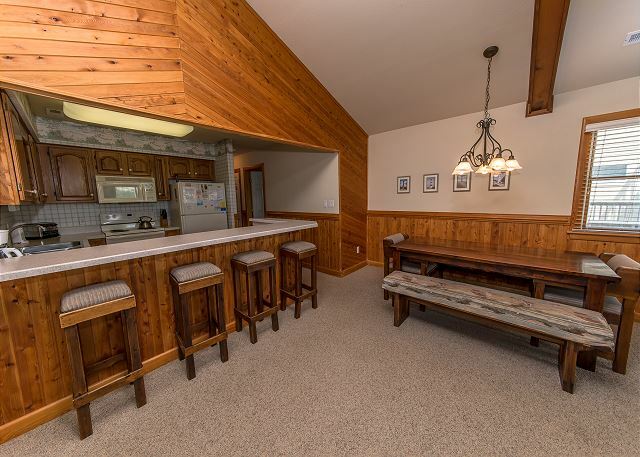 But there are multiple living areas which are comfortable and would be great for larger parties than ours, especially those with kids. All in all, though, we had plenty of space for us and had a great stay! Thank you for the awesome feedback! 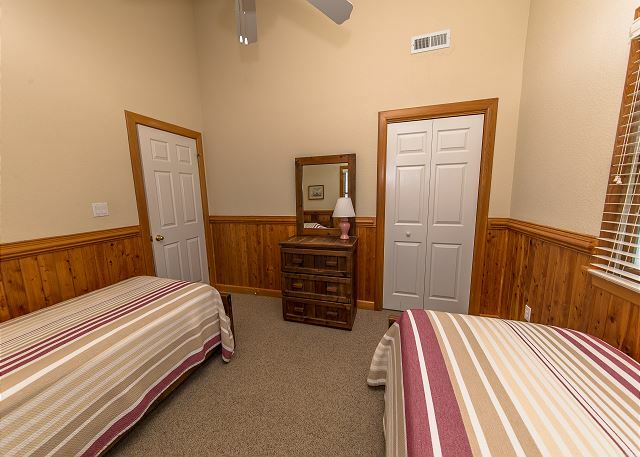 The owners take great pride in A Special Place and providing a wonderful guest experience. We hope you come back and see us in 2019! We had a wonderful stay at A Special Place. The location to the beach could not be beat. The beaches were not crowded as the community is private with no public access. Very family friendly. 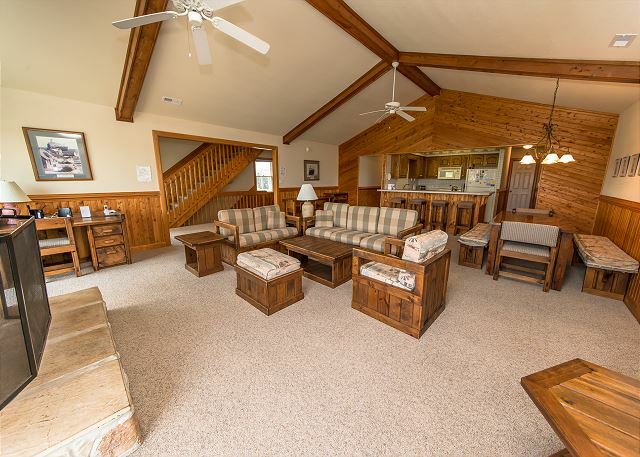 We had four kiddos with us ages 6 and under and this house and location were perfect. 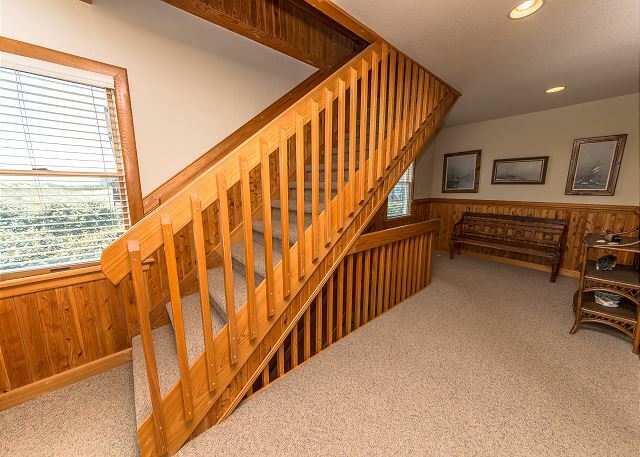 We intentionally chose this house because it had sturdy furnishings and nothing was "too nice" or "breakable". There is nothing worse then feeling like your kids are bulls in a china shop in someone else's house. We definitely plan on staying here again in the future. 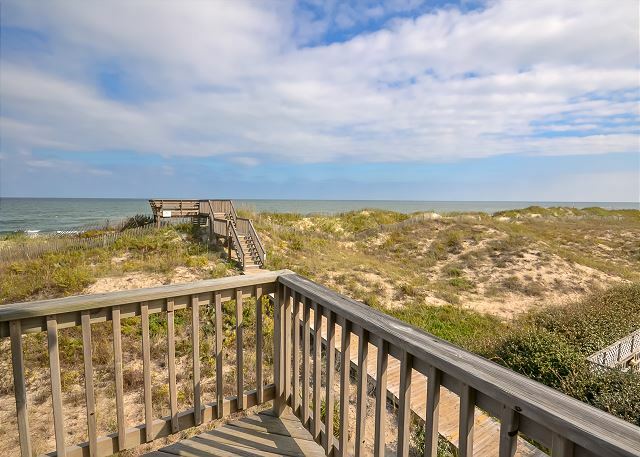 Very gracious owners, excellent location (grocery store is less than 5 minutes away), awesome beach access, overall wonderful place. Thank you for taking the time to provide us feedback regarding your recent stay. 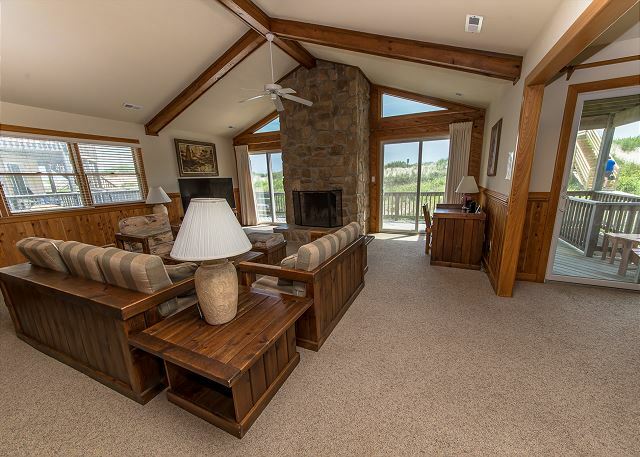 We are glad you and your family enjoyed your stay on the Outer Banks! We enjoyed our stay and this house was perfect for us because it is beachfront and being on the beach all day, every day was our plan. We are happy to hear that you were pleased with A Special Place! We hope to welcome you back in 2019! The House was very nice and clean.The walk to the beach description was a little misleading. My husband who is handicapped couldn’t walk the steps up and down to get to the water. Be prepared to do some walking. Happy anniversary! We are incredibly grateful that you took the time to review "A Special Place". We are glad you and your husband enjoyed your stay. The dunes that protect us during storms are ever changing and we apologize for any confusion. We hope to welcome you back for many years to come! We have stayed here for four years and plan to come back. 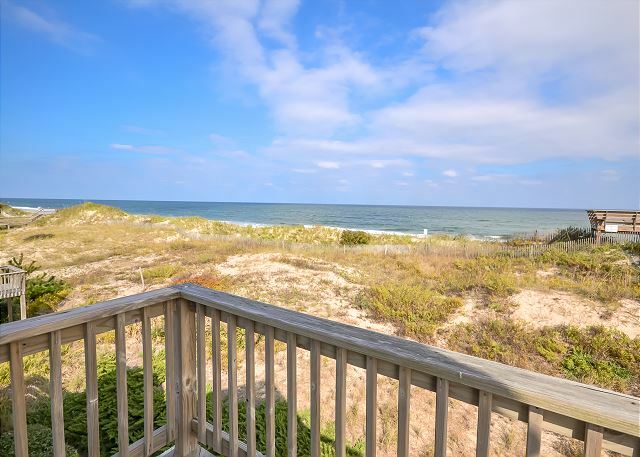 Thank you for being a repeat renter, not only to Kitty Hawk Rentals but to "A Special Place", as well. We appreciate your business and are happy we can provide your family with memorable vacations year after year. wonderful weather and a comfortable house. I think it was our 20th time staying there. So glad you and your family were able to enjoy your time at "A Special Place". 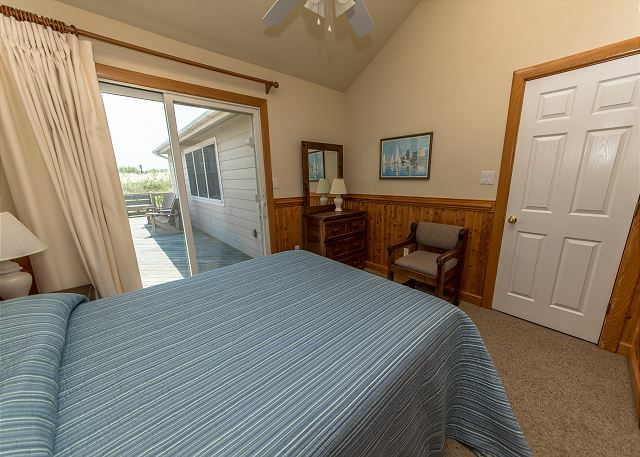 Kitty Hawk Rentals looks forward to your return. We loved our stay at this location!! 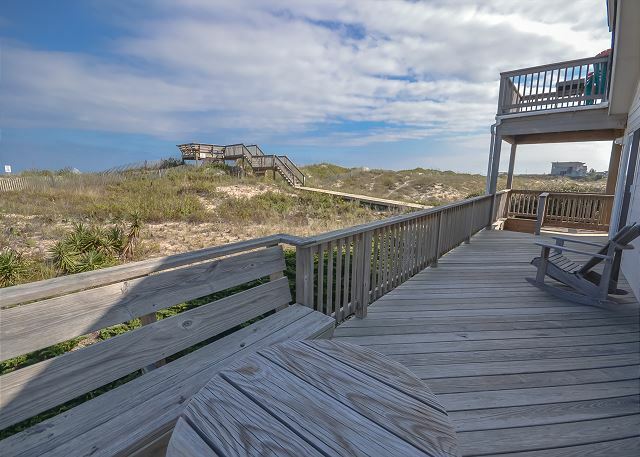 Easy access to the beach, beautiful views, lots of decks. There was plenty of room for all of us! "A Special Place" certainly is that, a special place. Glad your family had a wonderful vacation. Thanks for the positive review! Kitty Hawk Rentals and the owner of "A Special Place" thank you for your feedback! We are thrilled you enjoyed your stay. 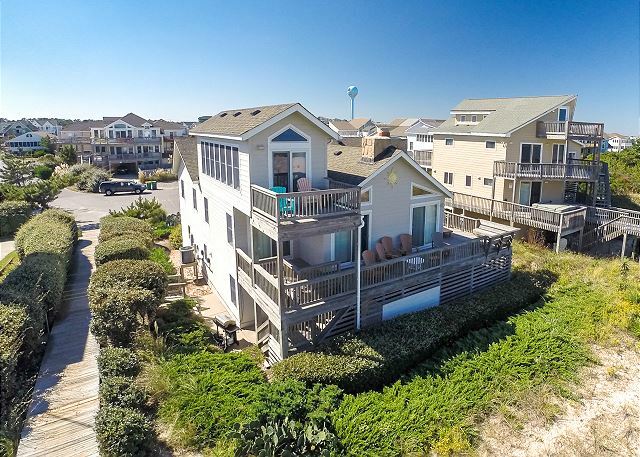 This oceanfront home makes for a relaxing vacation at the beach. Please let us know if you would like to pre-reserve this property again for 2017. We look forward to working with you in the future! We had an incredible and meaningful time. This house was truly a special place for me, my wife, and children to escape for a reunion. 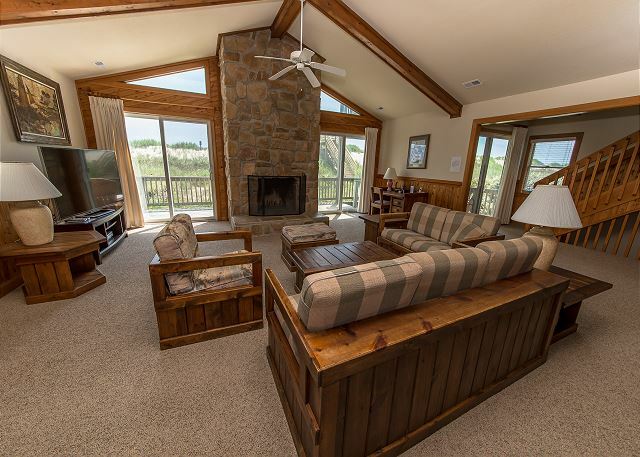 Quiet, clean, plenty of room to "spread out, with an absolutely beautiful view and location. Thanks again for both the place and the staff there. Thank you for the lovely review! 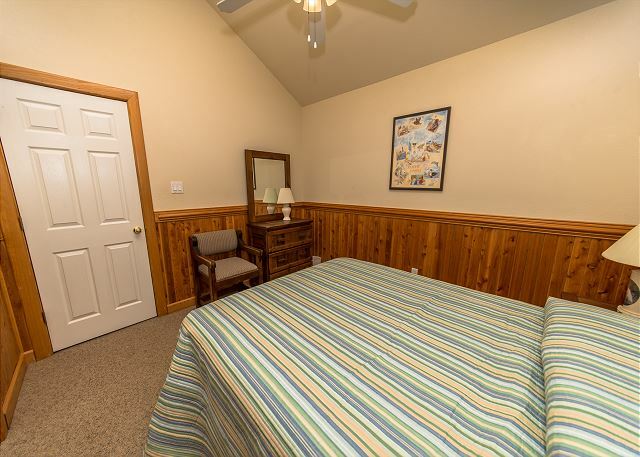 Warms our hearts to know we were able to provide a memorable vacation at A Special Place. We hope you'll return for another great family getaway! 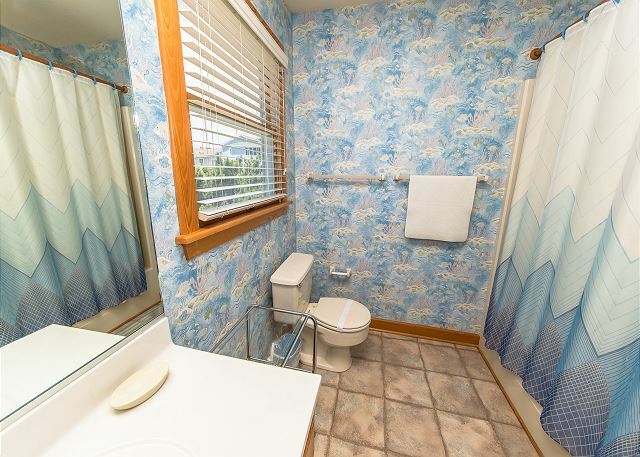 The house was a little dated and would have liked larger bedrooms upstairs, especially with connecting baths, but the house was very clean and in good condition, and the owners and rental company were great. Too bad the dunes have raised and you can't see the ocean from the main floor. Defeats part of the point of a beachfront house for us, but still was a very nice place and we had a great time. I'm happy your family enjoyed your time with us at A Special Place. 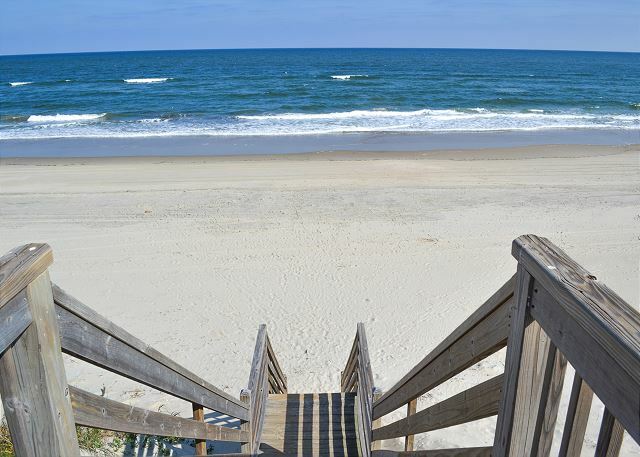 We do hope you'll return with Kitty Hawk Rentals for another memorable OBX vacation. 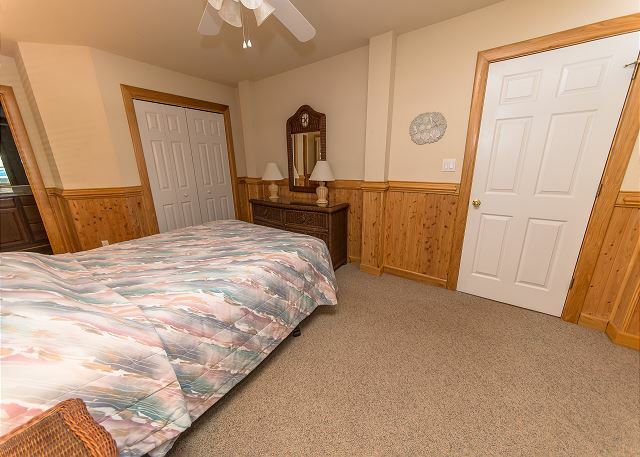 Beautiful location, plenty of room… bedding left a little to be desired. Overall, we had a great trip and would rent this house again. Thank you for taking the time to leave us a review. We apologize that you found the bedding to be sub par, we'll pass that along to the owner. We hope to have you stay again at 'A Special Place'. The location was first rate. We searched hard for the perfect location and we were not disappointed. The house was very clean and I appreciated that. It was actually a little bigger that we thought it was going to be from the write up so that was a pleasant surprise as well. We hope to go back someday in the near future. Paper Canoe and Cosmos Pizza are 2 of my favorite restaurants to go to for return visits. We also did a sound pontoon fishing trip which was very interesting and fun. Thanks for sharing! We hope you found, A Special Place, to be just that. We look forward to your return. We had a fabulous week despite the weather. We had a week of rain and cold. My group consisted of my two adult daughters, their significant others, my husband, myself, and a teen. The "cottage" had a plethora of activities! We played games, watched movies,ate well, and played miniature golf. 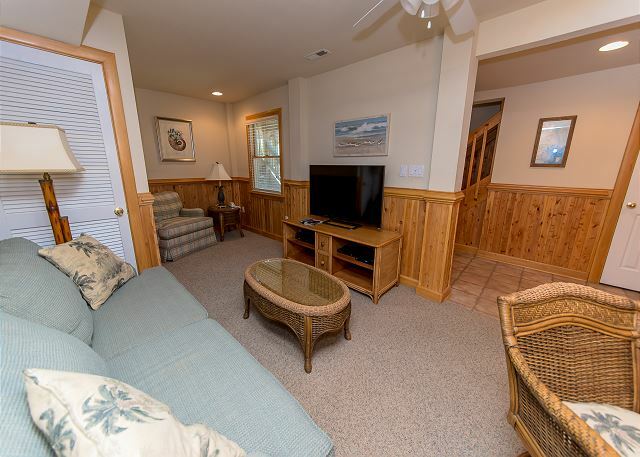 The owners had upgraded the televisions to large screened ones. 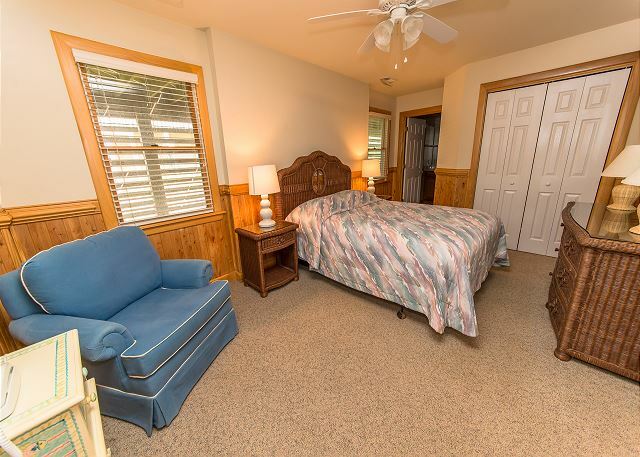 I was thrilled with the anti-bedbug mattress covers on all the beds, and that the lifeguard stand was right at the end of the walkway. Thank you for the review. Sorry about the inclement weather you experienced, which is obviously out of our control. We wish everyone's vacation was filled with sunshine filled days at the beach. Happy to see your family made the best of it and enjoyed everything "A Special Place" has to offer. 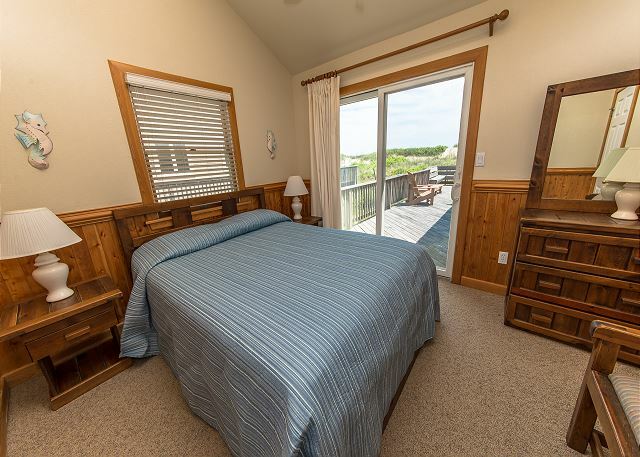 Kitty Hawk Rentals hopes you return to the Outer Banks with us for your next family vacation.